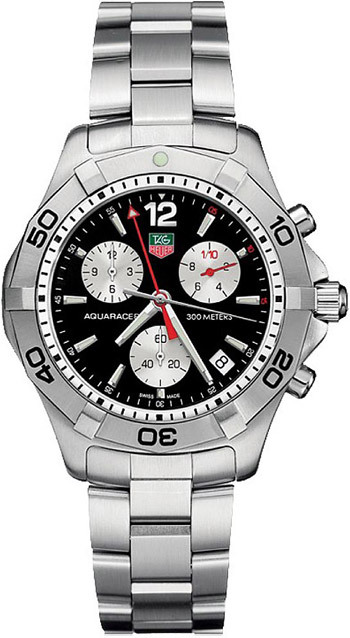 The TAG Heuer CAF1110.BA0804 Aquaracer Quartz Chronograph Men’s Watch is a sporty, stylish timepiece with polished facets, diamond-set hands, and luminous coating throughout for a lustrous look and improved readability. The Arabic numerals on the watch face and bezel add to the sporty look of this TAG Heuer masterpiece. The solid steel case measures 41 millimeters in diameter and coordinates well with the alternating brushed and polished steel finishes occurring throughout the bracelet. 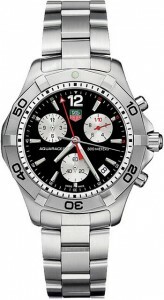 The two red hands on the watch face mirror the full-color TAG Heuer logo at the top of the dial. The ultimate sportsman’s watch, the crown and caseback are screw-down to ensure water resistance to 300 meters. The chronograph functions include a 1/10 second counter at the 2 o’clock position, a chronograph hour counter at the 10 o’clock position, a red chronograph minute hand, and a chronograph second hand in the center of the watch. The date appears at the 4:30 position. The caseback of the TAG Heuer CAF1110.bA0804 Aquaracer Quartz Chronograph Men’s Watch is engraved with a diver’s helmet. The double safety clasp is complete with folding buckle in solid steel and comes with an extension system to fit over a diver’s wetsuit. Sporty and functional, this TAG Heuer timepiece is a great option for any diver. I have the Aquaracer CAF1112 which is the same but with a blue face. The Aquaracers are a great watch and are very dependable. The biggest problem I have found with mine is that the black dashes on the bezel keep coming off. Now I have a watch that works great but looks terrible. I have sent it in 5 times and after each time the markings come off. I do not misuse my TAG. I remove it before going to bed, showering, any physical exercise and I clean it monthly at my local jewelery store (Jared’s) where I purchased it. I am very happy with the watch but each time I look at the missing paint, I wonder why I paid this much for it? My 14 yr old Fossil watches costing $100 have never lost their paint.